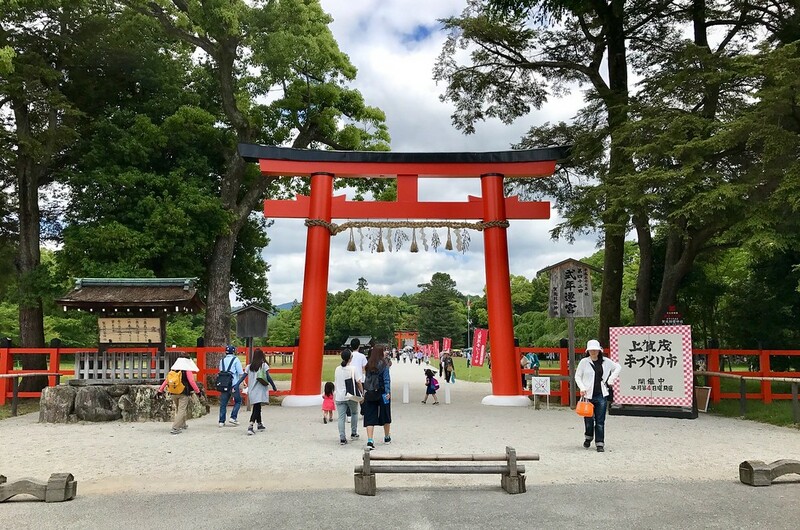 Kill two birds with one stone – do some sightseeing and get all your shopping done at Kamigamo-jinja Shrine! It’s held on the fourth Sunday of every month. UNESCO World Heritage Site Shimogamo-jinja Shrine near Demachiyanagi Station is a famous and much-visited sightseeing spot. But fewer people tend to make the long journey up north to its sister institution, the equally venerable Kamigamo-jinja, which has also been designated as a UNESCO World Heritage Site – this is rather unfortunate, as Kamigamo-jinja is incredibly beautiful and worth visiting. 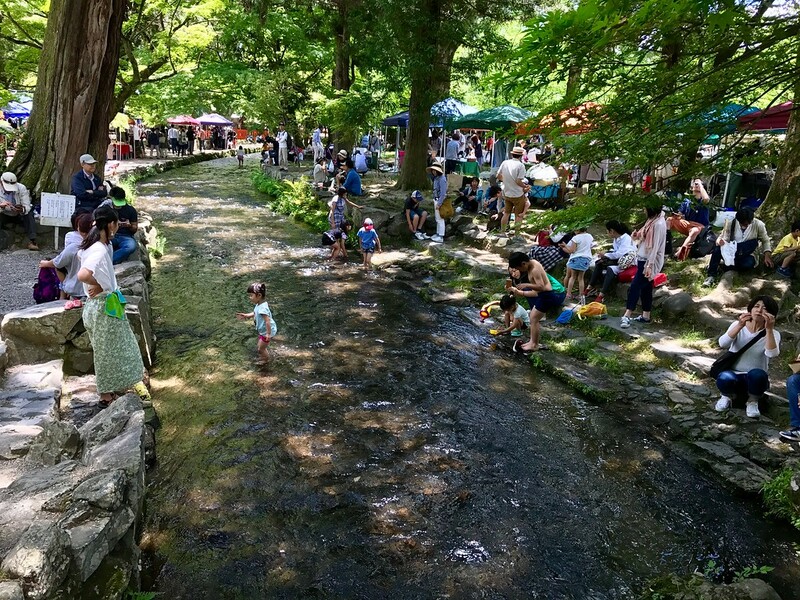 In terms of public transportation, Kamigamo-jinja is only accessible by bus and it’s situated around three and a half kilometers upriver from Shimogamo-jinja Shrine. It’s a long way to go if you have limited time to spend in Kyoto. 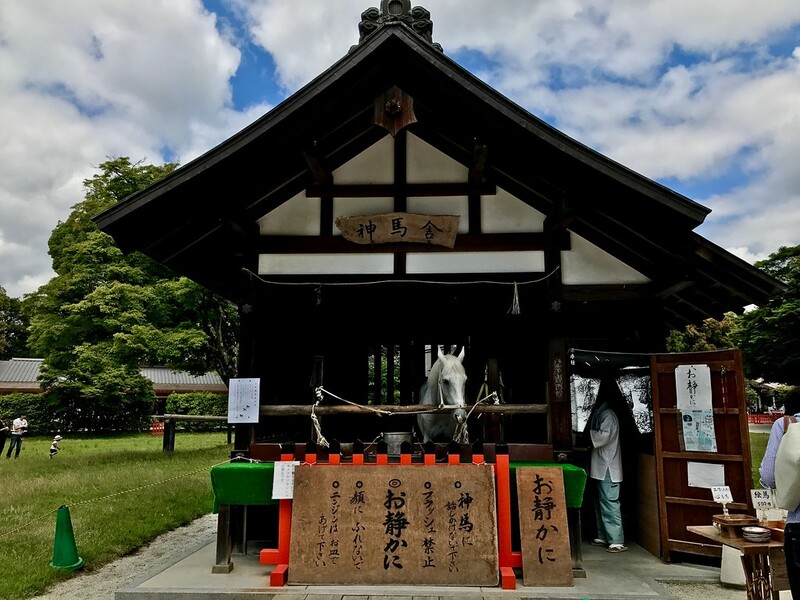 However, if you can time your visit to coincide with the monthly handicraft market held on the shrine grounds, Kamigamo-jinja makes for a wonderful day trip where you can get your sightseeing and shopping done at the same time! 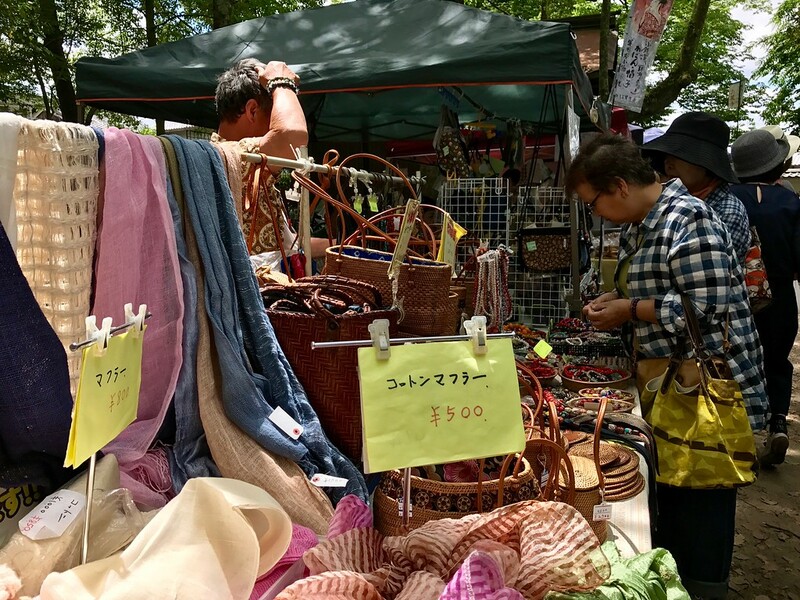 The Kamigamo-jinja Handicraft Market takes place on the fourth Sunday of every month. Having started operations in 2006, it’s now mushroomed to a consistent 250+ stalls every month, mostly clustered to the east side of the shrine grounds. Though the market takes place year round, I find May is a lovely month to visit – the ferocious summer heat has yet to appear, and this time of the year offers up blue skies, sunny weather and a distinct and welcome lack of humidity. It’s a Sunday market, so you’ll see many families with young children enjoying a day out here. The spacious shrine grounds offer an abundance of open field for playing. Towards lunchtime, many people set up tarpaulin mats under the trees to enjoy a picnic lunch – either homemade, or cobbled together from the many food stalls at the market. 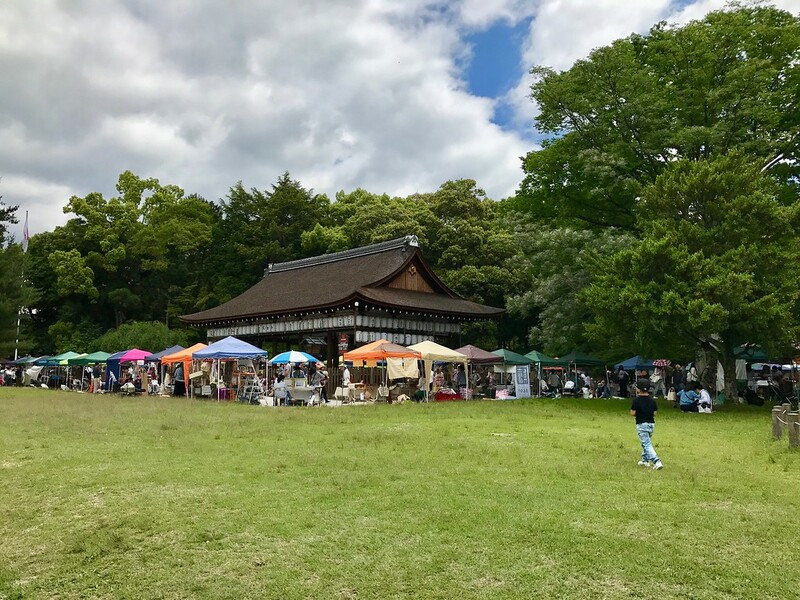 People often ask me where they should go in Kyoto to buy souvenirs, and I tend to be at a loss – but if you can time your visit to the ancient capital, a handicraft market is your best bet. There’s an extensive range of handmade goods available, and best of all, the people who made these items are usually right there. 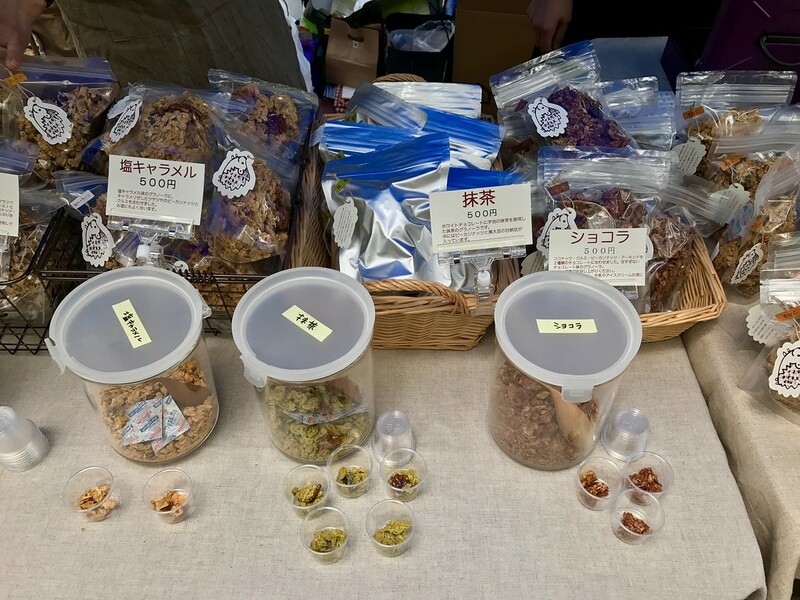 Here’s just a few examples of the items you can find at Kamigamo’s market: traditionally handbound notebooks, carved wooden bird whistles, lacquerware, T-shirts, postcards, calligraphy brushes, ceramics, granola, pickles, spice mixes. If you’ve had enough of shopping at any point, there is, rather conveniently, a beautiful creek to park yourself at for a quick rest. I had wandered around most of the stalls at this point, picking up pastries and snacks here and there, which made a most delicious al fresco lunch. Kids tend to love playing in the stream as well. 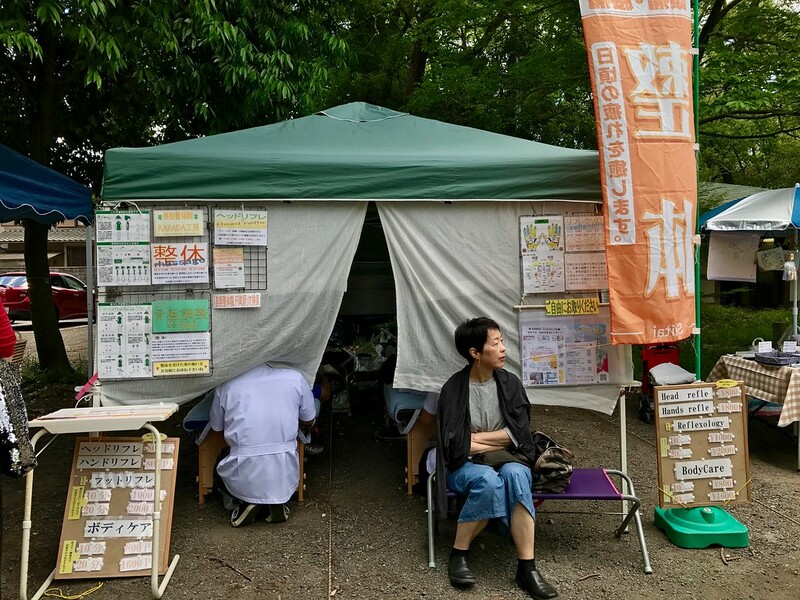 Here’s another brilliant idea at this market: a pop-up reflexology stall. Perfect for an impromptu massage when you’re a little overwhelmed by all the shopping. Like most handicraft markets in Kyoto, artisans and entrepreneurs wanting to set up stall here must apply in advance each month. They’re selected through a lottery system, so there’s no guarantee you’ll see the same person every single time you visit. 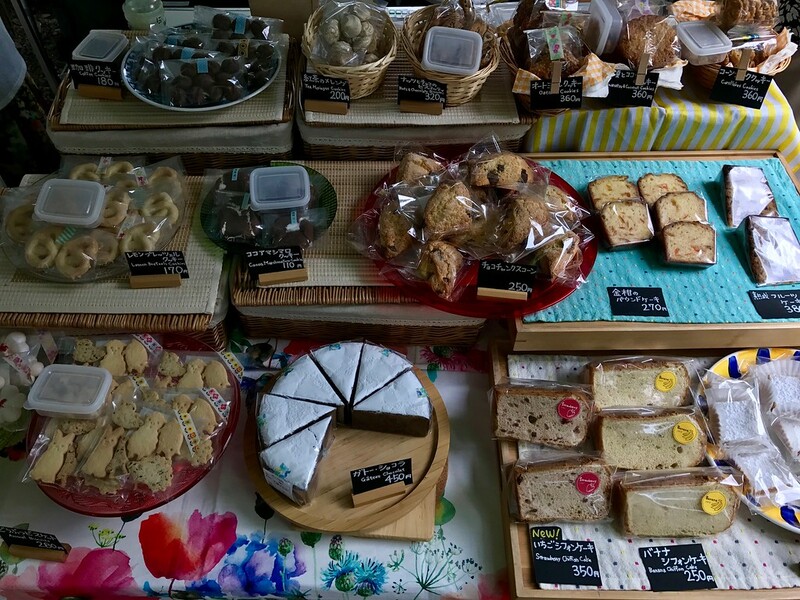 Nevertheless, that’s the fun of visiting these markets – discovering something or someone new each time! I won’t go into an exhaustive breakdown of the 250+ stalls at the market, so here are just a few of the stalls which caught my eye at Kamigamo-jinja. Colle Campo is run by a mother-and-daughter team, and the name of their business is an Italian translation of their surname ‘Okada,’ meaning ‘Hill Field.’ I don’t have the biggest sweet tooth, but Colle Campo’s cookies were so delicious that I had one and immediately wished I had bought another. What I had that day was the marshmallow cocoa cookie for JPY110 – a chewy, flat cocoa-flavored cookie with a gooey marshmallow filling that reminded me of S’mores, but without the extreme tooth-decaying sugariness associated with most American confectionery. Sample one and see for yourself. This was a slightly unexpected sight at a handicraft market, but worth a few minutes stop. Matsubara Kimchi is a Korean food shop near Saiin, and on this day they’d set up shop at Kamigamo. 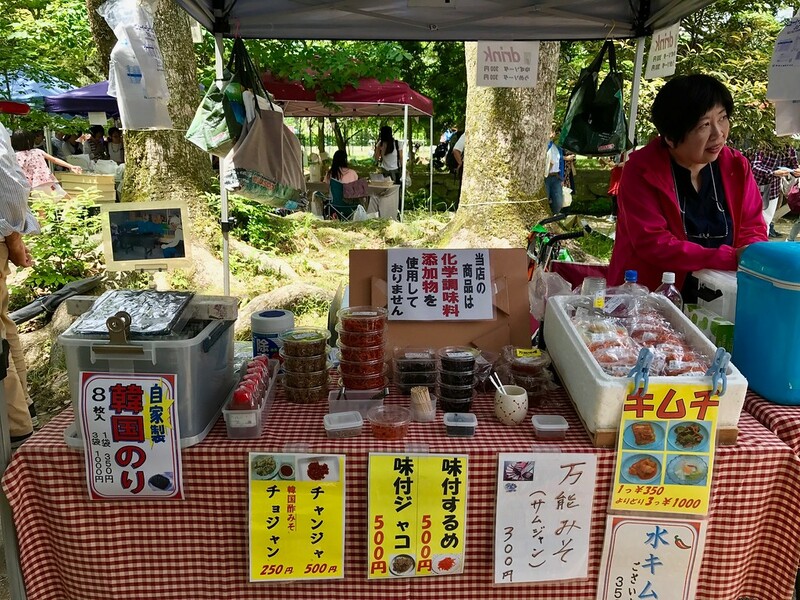 Their kimchi and flavored miso pastes are tasty, but I was drawn to their seaweed, stacked in a large plastic container to the left of the display table. They roast their own nori seaweed in the Korean style with oil and salt. A pack of 8 large square sheets costs JPY350, and makes a perfect and utterly addictive mid-afternoon snack. One cannot leave Kyoto without sampling its teas. 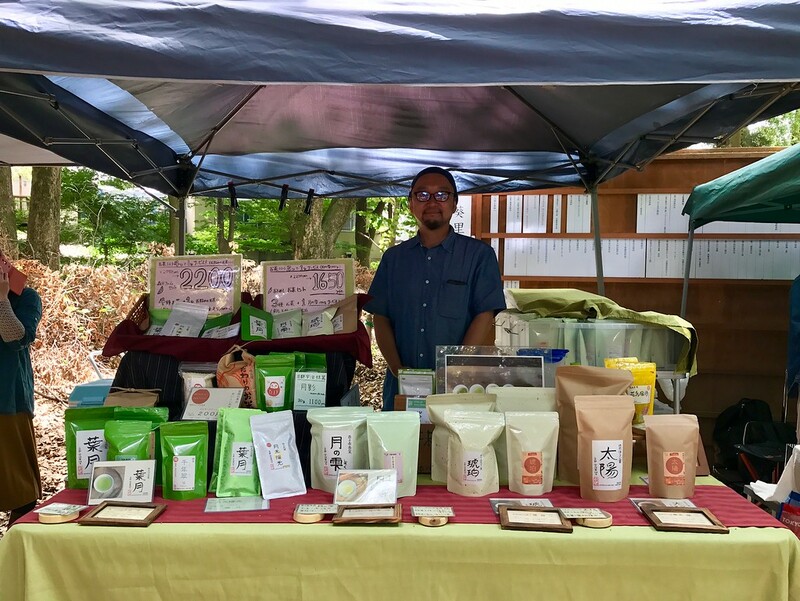 At Morii Farm’s stall, I particularly liked their hojicha. Hojicha refers to roasted tea, and the tea leaves used in this case are typically of a lower grade. However, Morii-san chose to roast a higher-quality tea in the manner of hojicha, resulting in an unusually delicate flavour for this style of tea. It’s especially suited to the cold-brewing method, and the subtle flavors really emerge after several hours of steeping these leaves in cold water. I feel like I’ve seen it all now. 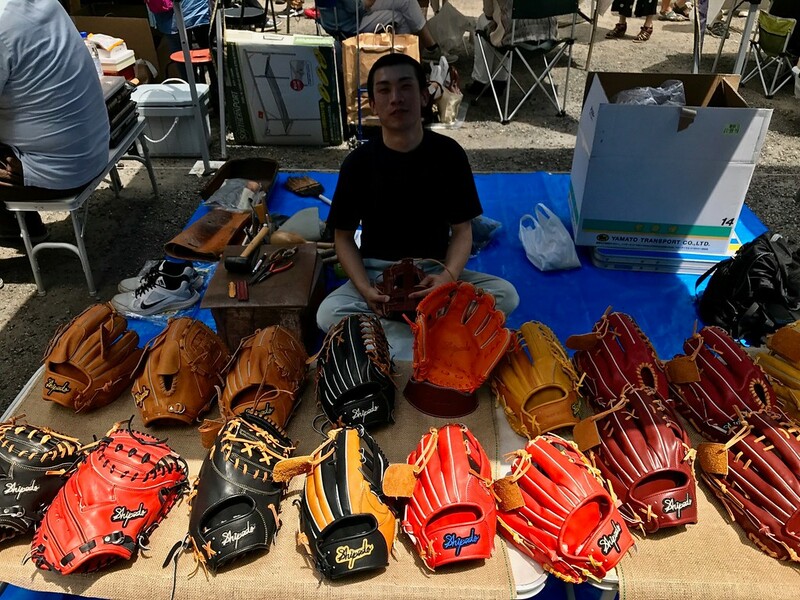 Shipado is a company which makes hand-stitched baseball mitts – it makes perfect sense in a country where the national sport is baseball and where craftsmanship is highly valued. I’m not one for dust-collectors, but these wooden animal sculptures by Tsujimura-san would make such a beautiful conversation piece in one’s living room. 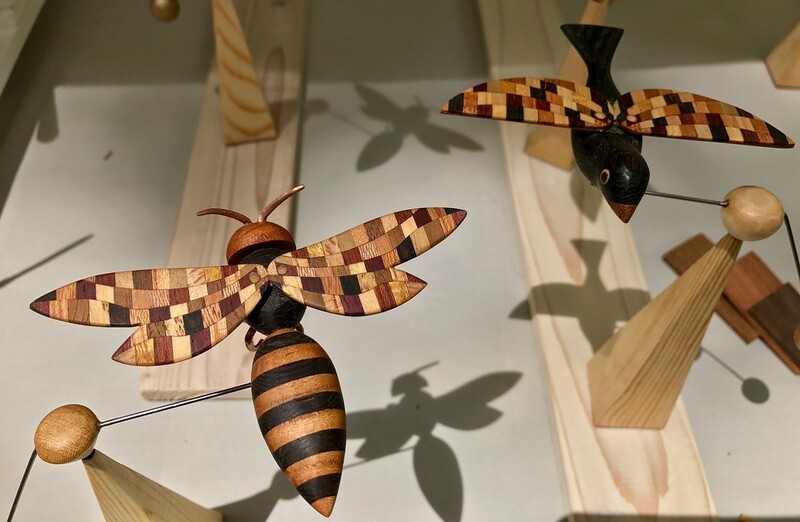 They’re fashioned in such a way that they balance on the tip of pyramidical wooden stands, and they tilt and sway with the slightest breeze, all the while without losing their balance. Remember this cat? 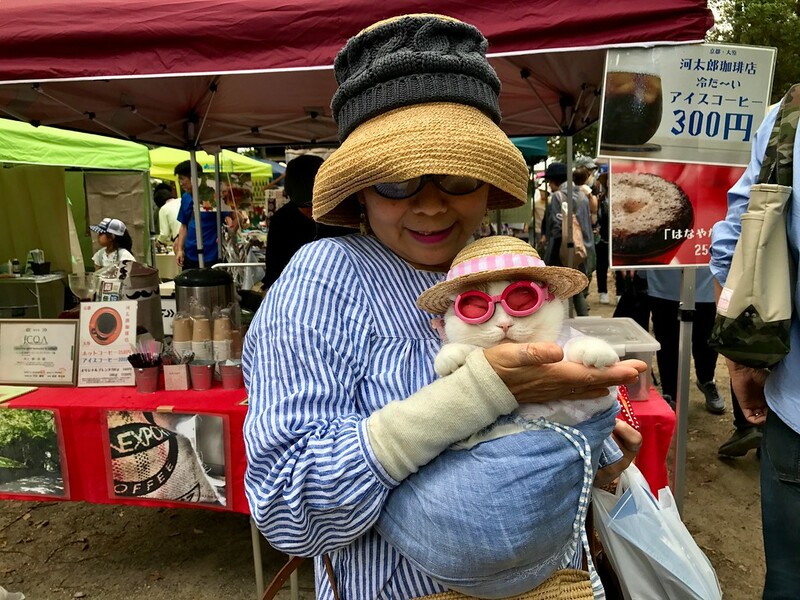 Mimi-chan and her owner made an appearance at Chion-ji Handicraft Market, and I found her again at Kamigamo-jinja. I’m perpetually amazed that Mimi-chan puts up with the rose-tinted goggles, and that she never seems to have a problem with attention. 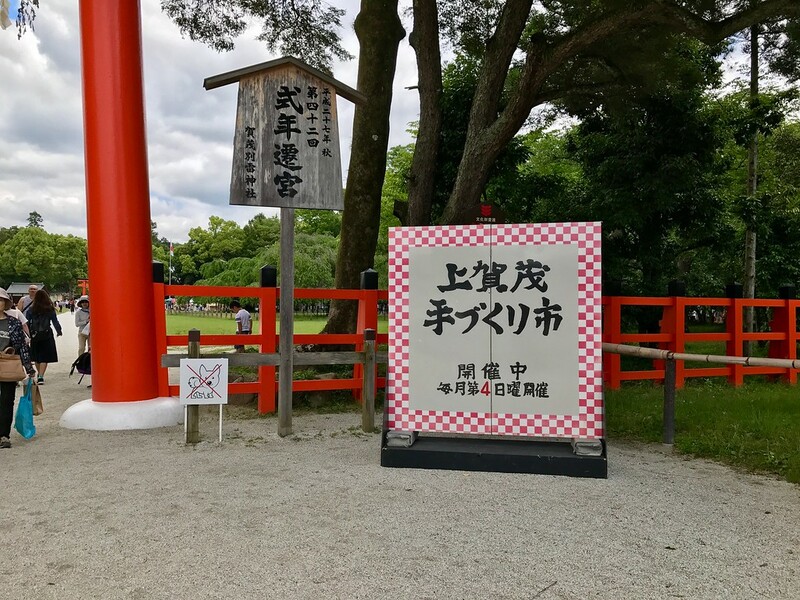 Of course, after you’re done shopping and eating, there is the entirety of Kamigamo-jinja to visit, if you still have the energy. Sundays during the summer months can be quite lively here too – there were two weddings taking place when I was there. 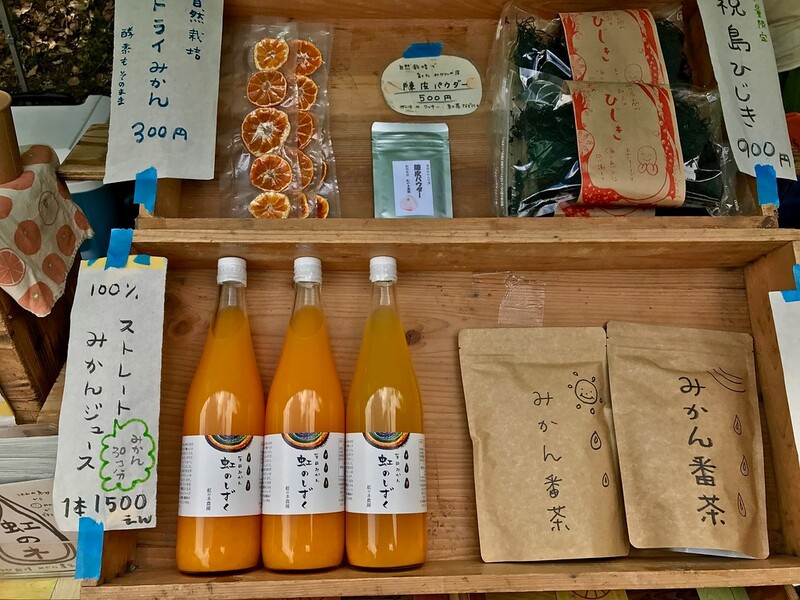 Many of the sellers above also have stalls at other handicraft markets in Kyoto. 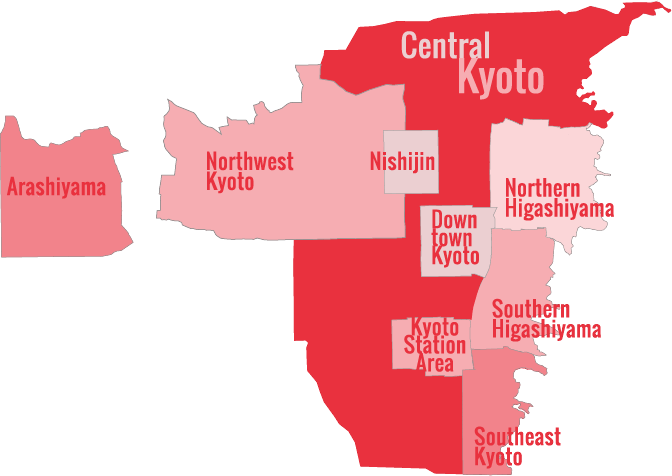 Some do make the trek from further-flung cities such as Osaka and Nara, so not all of them regularly attend. 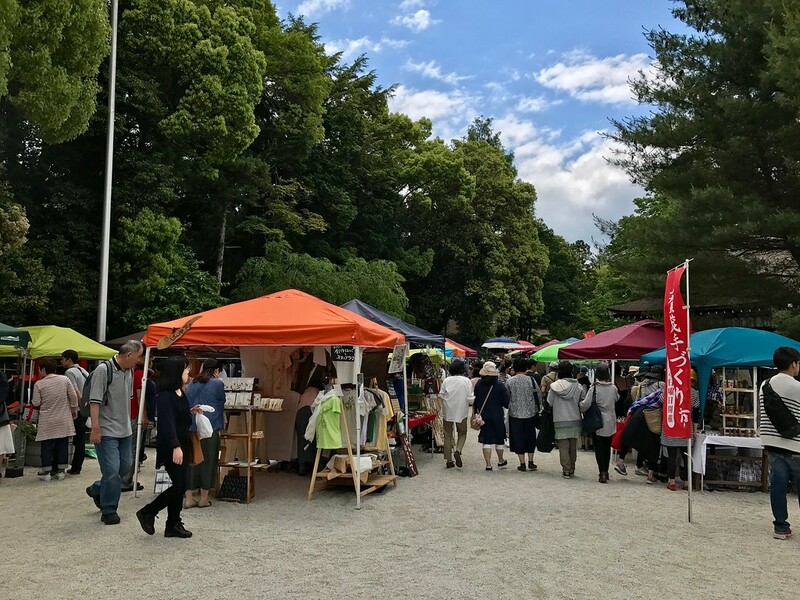 Overall, though, the Kamigamo-jinja Handicraft Market is a fantastic place to buy gifts and souvenirs – and it’s great to support your local small businesses! 9:00 – 16:00, 4th Sunday of every month. Kamigamo-jinja Shrine Handicraft Market is located in Central Kyoto. See our complete list of things to do in Central Kyoto, including places to eat, nightlife and places to stay. Florentyna Leow is a writer and photographer based in Kyoto, who has written for outlets such as Silverkris, ZenVita and Lucky Peach. Her interests include food, doors, and Thomassons. Her blog is updated here. She Instagrams regularly at @furochan_eats.